Eurocom is shipping the newest Intel Core i7-4960X Extreme Edition, i7-4930K and i7-4820K processors in its Panther 4.0 CPU and VGA upgradeable, custom built mobile supercomputer. When equipped with the 6 core, 12 threads Intel Core i7-4960X processor running at up to 4 GHz with 15 MB of L3 cache, the Panther 4.0 delivers class-leading multi-tasking and multi-threaded performance. The Panther 4.0 easily reaches beyond what was previously possible with mobile platforms. 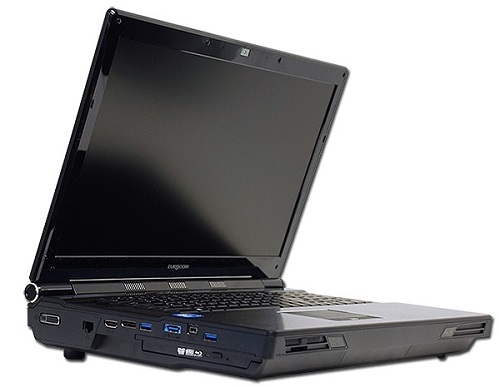 The EUROCOM Panther 4.0 is a supercomputer class laptop that is perfectly adept as a Professional Workstations, NVIDIA Quadro Mobile Workstation and a High Performance Gaming Station. The EUROCOM Panther 4.0 is fully upgradeable and custom built, allowing customers to choose exactly the processor, graphics, storage and memory they need to get the job done right and meet there specific computing requirements. Utilizing a heavy duty mechanical design the Panther 4.0 is built to last in the most demanding environments. The 17.3” EUROCOM Panther 4.0 weighs just 12lbs/5.5kg and measuring 419(W)x286(D)x57.9-62.1(H)mm / (16.76x11.44x2.31-2.48inch) is equipped with an integrated keyboard, 17.3” LCD Display, touch pad and Uninterruptable Power Supply (Battery Pack). Eurocom has offered customers fully upgradeable notebooks since its inception in 1989. Processor, graphics and memory upgradeability allows users to extend lifespan of their equipment while increasing performance and capability. Eurocom has been utilizing socket based CPU and MXM graphics technology to allow customers to choose the components they want at the time of purchase as well as give them the ability to upgrade the system long after. The new 4 and 6 core processors consist of the Intel Core i7-4960X, I7-4930K, 4820K, 4th generation processors built upon the 22 nm architecture and running at up to 4 GHz. The Intel Core i7-4960X, I7-4930K and 4820K family is the perfect engine for power users who demand unrivaled performance in data and financial analysis, 3D modeling and gaming. The large 15 MB L3 cache and quad channel memory interface of the Panther 4.0 are especially beneficial when running heavily threaded applications. With new features that make working with media faster than ever, new 4th generation Intel® Core™ i7 processors help multimedia enthusiasts create, render, edit, design and engineer—how they want and where they want on their EUROCOM Panther 4.0. Power efficiency in the new processors allows for significantly longer battery life combined with increased performance. The Panther 4.0 is equipped with dual MXM 3.0B slots rated for 100W GPUs and is ready to SLI the fastest NVIDIA GeForce, Quadro and AMD Radeon GPUs. The EUROCOM Panther 4.0 is a Workstation class Laptop with support for professional class NVIDIA Quadro K5000M, K4000M, K3000M, K2000M graphics as well as NVIDIA GeForce GTX 780M, 770M, 765M and AMD Radeon HD 8970M. Fully OpenGL 4.1 compliant and supporting a colour depth of 10 bits per channel provides the tools graphics and multimedia professionals need to do their jobs on the go. For heavy duty rendering where the utmost accuracy is required, the K5000M’s ECC (error correcting code) memory is up to the task. NVIDIA Quadro cards offer OpenGL quad buffered stereo support, for a smooth experience working with complex 3D models. EUROCOM Panther 4.0 uses quad channel memory, and enables the Panther 4.0 to initially support up to 32GB of DDR3 1600MHz RAM via four 8GB SODIMM 204 pin modules. With such massive amounts of RAM available and high performance Intel Core i7 processors, the Panther 4.0 becomes a great tool for virtualization and high performance professional computing environments. The Panther 4.0 has support for four Solid State, Hybrid, or Enterprise level drives with RAID 0,1,5,10 capability. With support for up to four 1.5 terabyte storage drives, the Panther 4.0 is able to offer 6 terabytes of storage. RAID 0,1,5,10 capability gives users the ultimate in performance or redundancy. SSD drives in particular will benefit from the use of the SATA 6Gbp/s standard available on 2 ports, eliminating bottlenecks for the fastest SSD drives. The EUROCOM Panther 4.0 has six choices of 17.3” Full HD 16:9, 1920x1080 displays, with choices of Matte, Glossy and 120Hz matte. The EUROCOM Panther 4.0 is available as a 3D enabled system or a non 3D system, as always Eurocom puts the choice in the hands of the customer. Supporting 3D technology provides users with an immersive 3D experience in games, movies, and any content with built in depth. The EUROCOM Panther 4.0 will also support Quad Buffering 3D technology, via supported NVIDIA Quadro cards to further enhance the capability and professional deployment of the Panther 4.0. The Panther 4.0 is equipped with a multitude of ports to connect to a variety of specialized equipment. High definition audio and video interfaces are supported to connect the Panther 4.0 to all the peripheral devices you need: S/PDIF is a digital audio interconnect standard based on the professional AES3 standard, it can carry two channels of PCM audio or multi channel surround sound. FireWire 800 is a high bandwidth, low latency isynchronous and asynchronous data delivery interface, ideal for audio, video and graphics transfer. HDMI 1.4a is a high quality audio and video interface ideal for transferring uncompressed audio and video from the computer system to digital devices. Display Port 1.2 is generally used to connect a video source, being the computer to a display device but can also be used to transmit audio. DVI-I is a digital and analog interface designed to transmit uncompressed video. The system allows for fast and easy media transfer though the 9 in 1 card reader. The slot ExpressCard 54 slot is compatible with 34mm wide cards as well as 54 and allows for additional connectivity of peripheral devices to the Panther 4.0, including a Magma Express Box expansion chassis containing optional PCIe cards such as video capture, media transcoding, audio processing. The EUROCOM Panther 4.0 is an enterprise class system for professionals creating, studying and manipulating sensitive data, because of this security is essential. Eurocom equipped the Panther 4.0 with a Trusted Platform Module 1.2 (TPM), finger print reader and Kensington lock port. The EUROCOM Panther 4.0 has a built in lithium-ion 78.44WH battery pack for added stability during potential power loss or need for transportation during operation. A 330 W, 100-240V AC adapter ensures the Panther has enough power to get the job done.